The Village provides fresh, clean water to approximately 17,000 residential and business locations throughout Downers Grove. Over 100,000 consumers enjoy water that is safe for drinking, cooking and bathing on a daily basis. In fact, the water supplied by the Village meets all Illinois Environmental Protection Agency (IEPA) standards, including those for lead. We are dedicated to providing water that is clean and safe for you to use. If you have any questions at all please contact the Village at 630.434.5500. We'll be happy to provide you with the assistance and information you need. In accordance with the 1996 amendments to the Safe Drinking Water Act, the United States Environmental Protection Agency (U.S. EPA ) requires that the Village file this report annually. The 2018 Water Quality Report summarizes the quality of the water the Village provided in the last year and includes information about where our water comes from, what it contains and how it compares to U.S. EPA standards. Effective July 1, 2016, the Village is enacting some enhanced notifications recommended by the Illinois Environmental Protection Agency (IEPA), to increase water quality awareness and reduce the potential for lead in drinking water. A watermain replacement project within one (1) block of your location. The repair of a watermain break within one (1) block of your location. The replacement of your water meter. Lead plumbing was used in homes built in the early 20th century and phased out during the 1960s. Lead pipes were banned by the U.S. EPA after 1986. Simply having a lead service line does not necessarily mean you have lead in your water. However, it does indicate that you may be at greater risk from lead if corrosion occurs or when the service line is disrupted, such as during a maintenance project. What are the results of the testing? During the most recent sampling period (2014), the sample from one of the 30 sites tested in the Village exceeded the 15 ppb threshold (~22 ppb). To meet IEPA regulations, no more than 10% of the samples can exceed 15 ppb. All of the other sites had levels below 5 ppb, which is the lowest level the test can detect for lead. Here is the complete Water Quality Report. 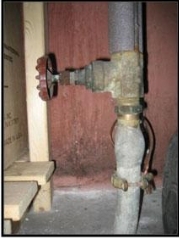 Next, go to the water meter in your home and locate the portion of pipe which comes through the foundation or floor from the outside and connects to the meter. (photo left). A lead service line is generally dull gray in color and very soft, whereas copper is dark orange. 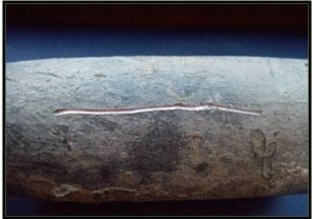 A sure way to determine if the pipe coming into your home is made of lead is to carefully scratch it with a coin (photo, right). Residents experiencing any quality issues with their water should contact Public Works at (630) 434-5460. A. The Chicago Water Department adds powdered activated carbon (PAC) to the water at the Jardine Water Purification Plant. The application rate of PAC is based upon the concentration of water vegetation and the number of taste and odor complaints. Residents are urged to contact the Village with any taste and odor complaints. These complaints are forwarded to the DuPage Water Commission, who then logs them with the Jardine Plant in Chicago. When there is a rise in complaints, adjustments to treatment are made accordingly. However, due to the travel distance from Chicago to the DuPage Water Commission, it takes approximately 24 hours to note a change in the water quality once it has been treated. B. In addition to the application of PAC at the Jardine Plant, the DuPage Water Commission constantly raises and lowers the water level in its standpipes. The purpose of this is to keep the water in the tanks fresh. Once a week, the standpipes are isolated and the water level in the standpipes is lowered. When the water level in the standpipes gets to a predetermined level, the tanks are refilled. C. The Downers Grove Water Division monitors our seven water towers daily to ensure that we are withdrawing water at a constant rate. This allows the water within our tanks to drain down during the day and fill back up at night. This keeps the water in our tanks turned over, refreshing the water within our mains.